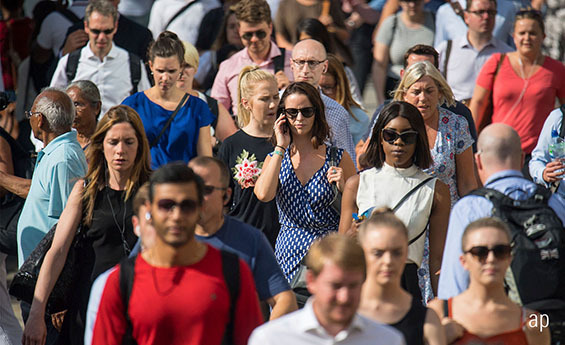 Since the bad weather in March was blamed for poor first quarter growth figures in the UK, and the warm June weather helped to boost second quarter growth to 0.4%, it looks best to consider the first half as a whole and average out at 0.3% a quarter. No doubt some work that got snowed under in March was tipped over into April and May. The Office for National Statistics points out that growth has been on a slowing trend since the end of 2014. Half of that period was before the referendum and half after, so I don’t buy into the notion that Brexit uncertainty is the one and only driver. Remainers who have taunted Leavers with the fact that Eurozone growth has outpaced the UK must face up to the reality that we are now about equal. Continuing slow growth in Europe, including the UK, should be factored into investment decisions. The great advantage of investing through the London stock market is the great international exposure that it offers. Take advantage. Actions speak louder than words. I don’t regard business confidence figures as a reliable forward indicator – still less consumer confidence – but I do take careful notice of results from recruitment companies. PageGroup (PAGE) has continued the trend of good news worldwide but of reservations about the UK. Page once specialised in financial services in the UK. Now home territory accounts for only 18% of revenue and the proportion is likely to shrink further. UK fees were down 3.5% in the first half of 2018 compared with increases of 21% in Europe, Middle East and Africa and with double digit gains in the Americas and Asia Pacific. The group has also diversified into a range of sectors, so it is protected against a turndown in one key market. As a result, pre-tax profits rose 18% in the first half of 2018 to stand slightly ahead of forecasts. It is strongly cash generative, so the dividend is secure. The interim payout was raised 5.1% to 4.1p and in addition, like last year, there is a special dividend of 12.73p. The shares are well up so far this year but even top side of 600p they offer a decent yield. Even though the best chance to invest has gone, Page is worth a look and is certainly worth buying on any weakness in the share price. It’s been an up and down 12 months for shareholders in insurance giant Prudential (PRU), with the shares bouncing between £17.20 and £19.80 only to end up just above £18.00 here they were a year ago. It could have been worse. Interim figures to the end of June saw premiums and profits fall yet the shares moved sharply higher, helped by an increase in the interim dividend. Or was that a small rise in profits? It depends if you look at operating profits, up 9%, or pre-tax profits, down 22%. The mad complexities of modern accounting methods are making companies like Prudential harder to assess. What is clear that it continues to do better in Asia than in Europe or America, hence the pressure from activist investors for the group to be split in two. Chief executive Mike Wells said plans to create two new companies, one with the mainly insurance operations in Asia and the other dealing with the largely investment services elsewhere. I am highly dubious. I am far from alone in the camp that says geographic and product diversity provide stability. I have seen too many investment fashions come and go to fall in with the current fad for “unlocking value” by dividing large companies. If they are successful as they are, leave them alone. Pru is a good long-term investment. Splitting it in two will create a short-term gain. Either way it currently looks a decent investment with a decent, solid yield. Rodney Hobson is a long-term investor commenting on his own portfolio; his comments are for informational purposes only and should not be construed as investment advice, nor are they the opinions of Morningstar. Rodney Hobson is a columnist for Morningstar.co.uk and author of several investing books, including The Dividend Investor and How to Build a Share Portfolio.